"In the 60 plus years that I've been living here, never have I seen a Rabbinic turnout like this; nor did I think it was even possible!" remarked one incredulous participant upon viewing the dais, which was graced by nearly 60 local Rabbanim. Everyone was there. 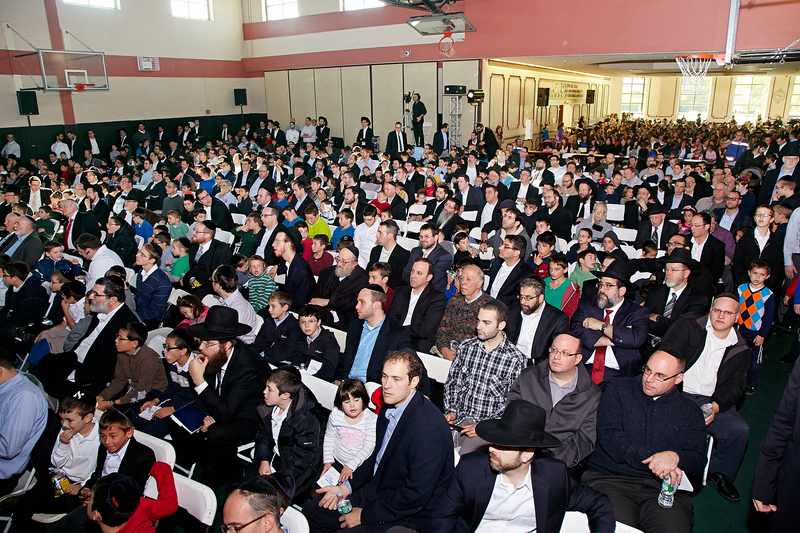 Representing every segment of the community and every shade of Orthodoxy from the right to the left, over 2000 men, women and children gathered at Yeshiva Sh'or Yoshuv this past Sunday, to express both unity and gratitude, one year post-Sandy. In coordinating this event, Achiezer had approached more than 20 local Yeshivos and schools to participate by reciting and completing Sefer Tehillim prior to the Sunday event; after which the entire community gathered together for a grand Siyum celebration. Upon entering Sh'or Yoshuv's gym, many could not help but flash back to the poignant memories this place held for them, from the role it played just one year ago as a primary Sandy relief center. Rabbi Boruch Ber Bender's opening remarks encapsulated the goal of the event: to express unbounded Hakaras Hatov to Hashem, for having mercifully, and miraculously, spared the community any loss of life. In mentioning his personal memories of that fateful night, Rabbi Bender recounted: "Just hours after the storm had begun, several activists were huddled together trying to figure out the best plan of action-if there could even be one. The question [in our minds] was not if we were facing a tragedy of epic proportions; it was where, when, and how." Miraculously, every member of the community was spared; and so, collectively, the community gathered to simply say "thank You for keeping us alive; and for giving us the strength to rebuild." Tehillim was then led by local Rabbonim, each representing different segments of the community: Rabbi Menachem Feifer, Rabbi Binyomin Kamenetzky, Rabbi Chaim Wakslak, Rabbi Kenneth Hain, Rabbi Pinchus Weinberger, Rabbi Tzvi Selengut, Rabbi Zalman Wolowic, and Rabbi Avrohom Halpern. Assemblyman Phil Goldfeder, who was so instrumental in the recovery effort, then addressed the crowd, with his own unique perspective of the 'amazing Kiddush Hashem' made by the community at a time when 'all the world was watching': "All across the city, they learned from us - how we work together, how we build programs that work. When the mayor asked me, how do we do this, how do we do that, I pointed to the Far Rockaway community - neighbors helping neighbors, families helping families, friends helping friends." Rabbi Fischel Schachter, who had been carefully selected as keynote speaker for his universal appeal to both adult and child audiences, described the incredible Kiddush Hashem engendered by the gathering itself. Through stories and Chizuk, Rabbi Schachter brought home the point that we must realize the Yad Hashem in everything, and never take His goodness for granted. Next to take the podium was Gavriel Weberman, a ten-year-old boy whose personal description of the events of last year touched everybody. Final selections of Tehillim were recited Passuk by Passuk by the crowd in unison, led by Rabbi Yaakov Bender, Rabbi Mordechai Kamenetzky, and Rabbi Eytan Feiner, who delivered the closing, emotional Yehi Ratzon. The program closed with a special musical presentation by Eitan Katz on the guitar and Baruch Levine on the piano, accompanied by a violinist. The slow songs fully expressed the emotions of the moment, and the special lyrics to Baruch Levine's new Modim song mirrored the thoughts of the day: We gather here together as one community; to express to Hashem -- Modim, joyfully. Finally, the crowd broke out in a spontaneous dance as the notes of Tov L'Hodos and Ki Hirbeisa rang through the air. As the circles of crocheted Kippah, black hat, and Bekeshe clad men whirled around in unison, the vision of communal Achdus thought by so many to be a dream came to life in vivid color. Truly, it was the event of a lifetime. To view footage of the event, visit our media page. This community event was sponsored anonymously B'zchus Refua Shlaima: Hentcha Hadassah bas Sarah Rochel and Malka Perel bas Rivka. Achiezer extends a special appreciation to Hatzalah, RCSP, NCPD, NCPD Auxiliary Unit, NYPD and of course Yeshiva of Sh'or Yoshuv for ensuring a safe and pleasant event.